Is it right to say that closing the deficit requires that we tackle tax credits, a measure which on any view will hit the poorest hardest? 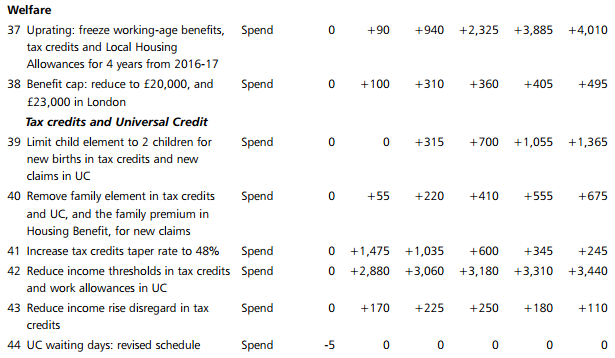 Here’s the section in the Summer Budget Red Book which identified the savings from – freezing, limiting entitlement to, increasing the taper rate of and reducing income thresholds for – tax credits. If you add up the final column (which shows the savings for 2020-21) excluding the benefit cap (a separate measure) you reach a figure of £9.735bn. Obviously that number takes in also some measures not connected with tax credits but as the savings are not dis-aggregated between these different measures I’ll assume against myself that everything under these headings relates to tax credits. How else might that £9.735bn be funded? Here are some other measures. These are also taken from the same Summer Budget (and again the last column relates to 2020-21). Where necessary, I’ve added a little narrative. The Conservatives pledged in their Manifesto to increase the personal allowance to £12,500. Were they to do that the IFS estimated (see page 14) the cost in 2020-21 to be £4bn. Let’s assume they deliver on this Manifesto pledge. In part because so many people do not pay income tax, and in part because the biggest gainers are two-earner couples where both can benefit from the higher allowance, increases in the personal allowance benefit those in the middle and upper-middle parts of the income distribution the most. Again, the Conservatives pledged in their Manifesto to increase the higher rate threshold to £50,000. Were they to do that the IFS estimated (see page 15) the cost in 2020-21 to be £1.9bn. Let’s assume they deliver on this Manifesto pledge. (And it’s worth noting that this yearthe higher rate of income tax will be paid only by the 5 million highest earners in the country: see table 2.5 for 2015-16). This measure hardly requires explanation. But HMRC’s latest inheritance tax release shows that (in 2012-13 the latest year for which the figure is given) Inheritance Tax was paid by only 17,917 estates. At 20%, we have the lowest rate of corporation tax in the G20, alongside Russia and Turkey. The case for decreasing it to 18% is not easy to see. More on this for those interested here. Add those sums together and you arrive at £9.3bn – within fiscal spitting distance of the £9.735bn figure above. If you’re a stickler, I’ll take you back to the 2014 Autumn Statement (the final column here relates to 2019-20 but, again, ignore this difference). As I showed here, the benefits of this measure go disproportionately to buy to let landlords. And voila. You’re over the top. Of course there’s an ideological decision being made as to how the deficit should be closed. IDS seems happy to admit that it is ideology. He believes that poverty is not best addressed by providing the poorest with money form the state. He thinks it should come from being employed. Ultimate logic of that signals the end of the welfare system for all of us. Seems dystopian to me, but utopian (or better) to him.. Listening to an item on pension reform on radio 4 they said that reducing pension tax relief from 40% to basic rate for higher rate taxpayers would yield 12-15bn pa. Sounded high but if right shows another very clear choice which does not require cutting tax credits. Given the increase in higher rate tax allowance would seem fair to limit tax relief to basic rate. These are all good alternative savings. They actually underestimate the amount of alternative savings that could be made from not raising the tax threshold and not lowering corporation tax, as there are previously announced changes to these taxes in previous budgets/autumn statements that have not yet been introduced. I think that’s right… and thanks for pointing it out.